The businessman and reality-TV star says working with the Union Gospel Mission opened his eyes to the troubles of others — and the larger problem of homelessness. One rainy night in 2014, a homeless man, an outreach worker and a multimillionaire sat on a patch of grass beside a church in Seattle’s Capitol Hill neighborhood. The homeless man told his story, of losing his way and losing everything. How did he end up here? The outreach worker — a former meth addict who had gotten off the streets just the year before — listened and nodded. And Robert Herjavec, who had built a $200 million fortune in cybersecurity, and a star on the reality show “Shark Tank,” burst into tears. 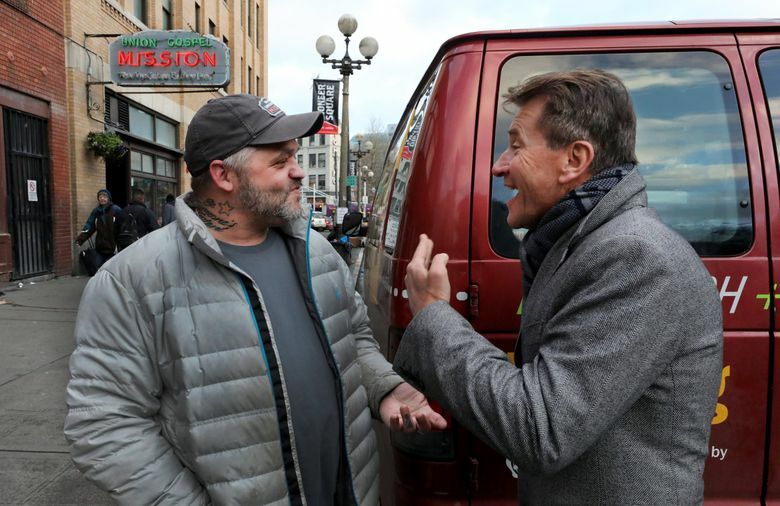 On Wednesday, Herjavec returned to the Union Gospel Mission (UGM), a shelter in Pioneer Square, to reconnect with the place that took in “a broken man,” and put him to work for two weeks, serving a community that he knew little about. 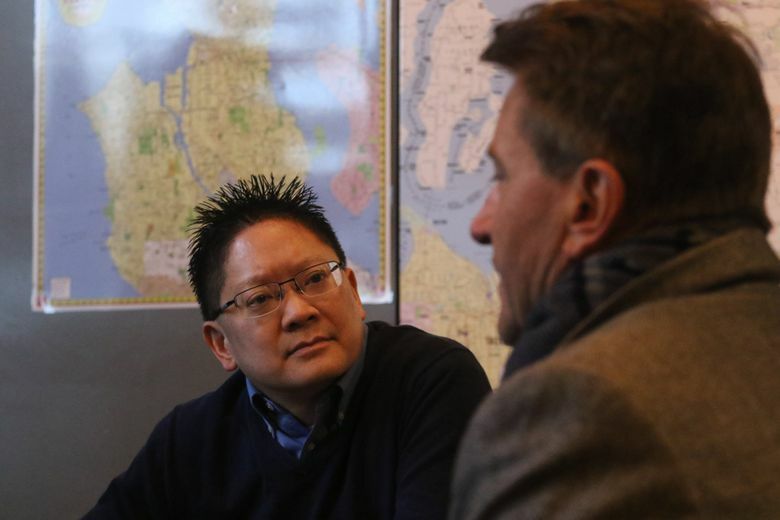 It opened his eyes to the troubles of others — and the larger problem of homelessness. 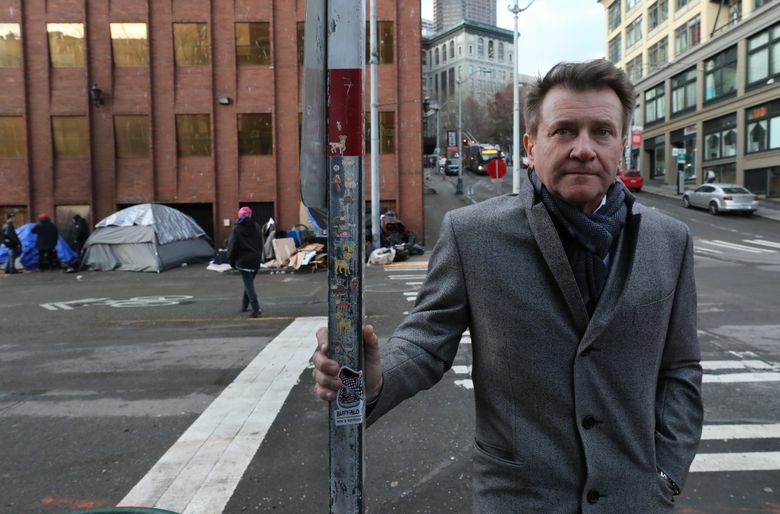 On his way into Seattle for business meetings, Herjavec immediately noticed the increase in homeless encampments along the freeway and city streets. The problem is indeed worse than it was when Herjavec was here, UGM President Scott Chin told him. The last annual one-night count of homelessness found more than 12,000 people living on the street — a 4 percent increase. 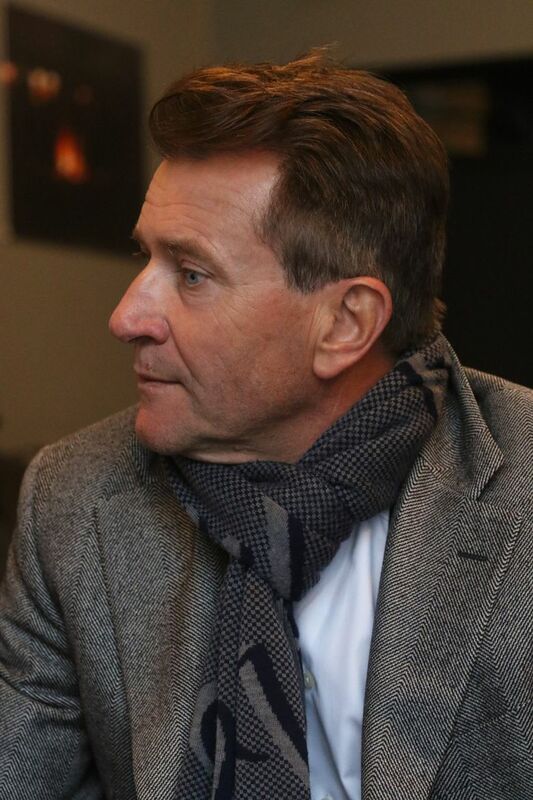 The businessman and reality-TV star first connected with the UGM on the recommendation of his Toronto-based pastor, John McAuley, who was counseling Herjavec after he and his wife of 24 years had separated. (McAuley was friends with former UGM president Jeff Lilley). “I needed to get in touch with my humanity and self-worth.” Herjavec recalled. “I had a lot of noise in my life and I couldn’t see straight. I think (McAuley) sent me to connect with other human beings. Herjavec worked in the kitchen, and one night was assigned to the front desk. That’s when he met Richard McAdams, a former meth addict who had completed the UGM’s recovery program the year before, and was interning as an outreach coordinator. Herjavec asked McAdams what he did. Search and rescue, McAdams told him. He went out every night, offering help to those living on the streets, under bridges, in RVs and in encampments. “I’d be interested in doing that,” Herjavec responded. The two men ventured out that night, and eventually ended up sitting on the grass, in the rain, talking to a man in need. The experience also bonded the two men. Herjavec and McAdams stay in close touch, and when Herjavec married his “Dancing with the Stars” partner Kym Johnson in a sumptuous wedding at the Four Seasons in Beverly Hills, McAdams was there. When McAdams graduated from the UGM’s internship program, Herjavec marked the occasion by buying a new van for the search and rescue effort. (“He knows how much it means to me,” McAdams said). His relationship with UGM has continued to this day. He has donated nearly 300,000 pairs of socks and is a “faithful donor,” Chin said. Herjavec is also completely at ease in the chaos of Pioneer Square, strolling past — and smiling at — the line of men outside the mission’s door. “As long as there’s hope, there’s life,” Herjavec said. “Without hope, there is no life. You’re not alive. You’re just existing. Indeed, six months after he left Seattle, Herjavec was cast on “Dancing with the Stars,” and partnered with Kym Johnson. They were married in 2016 and now have 10-month-old twins. “When I came here I was just who I really am,” he said. “And so I’ve always gone back to this place. It gives you a certain amount of empathy. I’m a very understanding human being now.